(Last Updated : 07.01.19). HTET Answer Key TGT Maths Exam 06.01.2019 Paper Solution - Download Answer Key of HTET TGT Maths Exam 6th January held in Morning session. Official answer key of HTET TGT Maths 2019 can be checked here as the official paper solution is available on 07.01.2019 on the HBSE website. 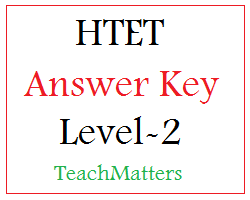 Official Answer Key with Solved Questions are available here for HTET TGT Mathematics Level-2 Exam JAN 2019. Check here HTET Level-2 TGT Maths & Science Answer Key 2019 Paper Solution for all sets - A, B, C & D.
Note : This is official answer key. The HTET TGT Maths Answer Key will be updated at regular intervals as the official answer key of HTET TGT Maths & Science exam 06.01.2019 is released on the official website.